Last week, the Australian Classification Board revealed Ubisoft was releasing Sports Party on the Switch at some point in the near future. Now, the French-based publisher has officially announced the two hand-drawn adventures - Child of Light and Valiant Hearts: The Great War - will arrive on the Nintendo Switch on 11th October and 8th November. Child of Light - by Ubisoft Montreal - was originally released in 2014 on the Wii U and is a coming-of-age story about a young girl and who is struggling to save the lost kingdom of Lemuria and her ailing father. The game is a side-scroller with RPG and turn-based elements. The main character, Aurora, and her firefly known as Igniculus, will be team up with multiple other party members to take down the Dark Queen of Lemuria. There’s levelling, skill points to unlock and abilities to upgrade, while you can also craft and improve equipment for your party. The Switch release will allow two players to work together, with one player controlling Igniculus and helping to solve puzzles. Valiant Hearts - by Ubisoft Montpellier and also released on multiple platforms in 2014 - is about five individuals brought together by the horrors of war and a faithful canine companion. It’s a story filled with themes of friendship, love, sacrifice, and tragedy and is based on the First World War. Throughout the game, you explore famous locations as you adventure through history, and solve puzzles while sneaking behind enemy lines. The Switch release will include touch controls - promising a level of interaction with characters like never before. Switch owners will also have access to an interactive comic book. Valiant Hearts: Dogs of War tells the story of Walt the dog and his sister Cassie during the years of WW1 as they navigate trenches and deliver messages to soldiers. Are these Ubisoft games of interest to you? Did you play the original releases? Would you like to see a sequel to Child of Light? Tell us below. Sweet! I always wanted to play Child of Light but never got around to it. Valiant Hearts sounds interesting too. Both of these will be purchases for me. I never got around to Child of Light, but Valiant Hearts is wonderful and very touching. Child of Light was great on the VITA - awesome game. Could not get into VH. Never played either. Looking forward to it! I have been the biggest Ubisoft supporter for the Switch, I very much appreciate the fact that they are supporting the console. Rayman Legends, Mario Rabbids and its DLC, South Park Fractured But Whole, and plan to buy Starlink. I even bought Monopoly and have only played a full game once (though, in that case, it was only 20$). They also have the best sales on retail sites with games going low often. Only games I haven't purchased are Just Dance because they are not suited for me. On another note, anyone have UNO? I want to also purchase it, but am a little scared the online player base isn't up to snuff. @Agramonte - Say no more! Child of Light is amazing. Played it through 3 times on Wii U. Definitely buying it again on the switch. I never did finish Child of Light. Maybe this will finally be my excuse to do so. I loved Child of Light. Don’t think I’d double dip, but it was such a lovely game. Triple dip for me. Wii U, Vita, and now Switch. @Paraka I hope it does happen cause I really liked Child of Light. Though I hope they increase the difficulty for the sequel. @Paraka wow, thanks. That is a great catch and awesome news. This is amazing news... I had a feeling that we would get a port of Child of Light. I never got around to actually buying that on Wii U even though it was on my list of must-haves. I think I was secretly holding off because I knew the Wii U was going to die and I knew the digital copy would’ve gone with it. Now I’m so happy I waited... I’ll finally get to play it! I'm quite happy about this! I adored Child of Light on Wii U. Honestly the lack of a Child of Light II announcement was my biggest disappointment at Ubisoft's E3. Hopefully Ubi remedies this issue soon! Valiant Hearts also looks pretty cool, never played it before but I'm willing to give it a shot. Dammit! I literally just bought Child of Light on the Steam Summer Sale! Oh, well. It was at a good price, so I shouldn't be complaining. I played a bit of Child of Light on PS4. The Grandia style combat was actually the biggest thing that drew me to it. I loved Child of Light. I knew it was just a matter of time before they'd release it on Switch. Welp good thing I forgot to buy child of light. 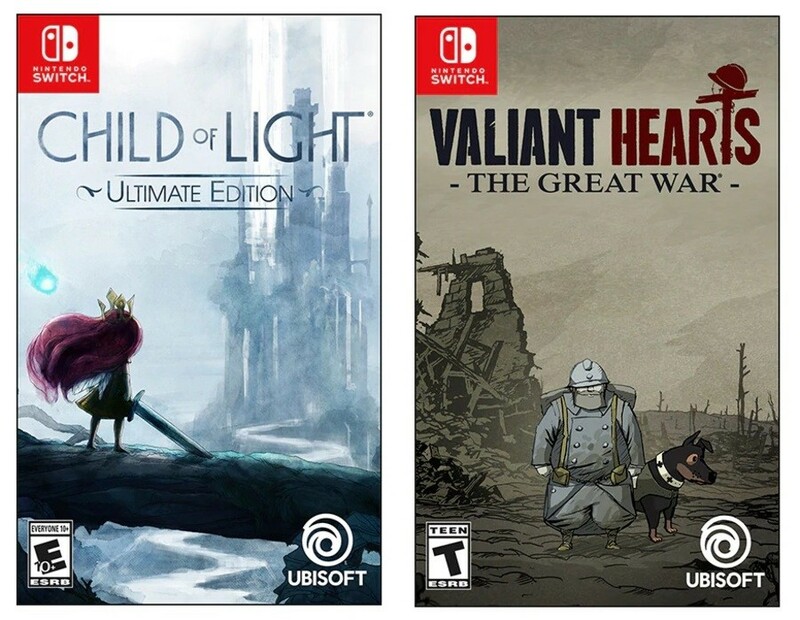 I loved Child of Light and will defiantly have to buy it again for the Switch (Valiant Hearts was also great but not quite worth a rebuy for me). This console has mostly become a way of buying games I already own so I can play them portably, not sure if that's a good thing or a bad thing. Meh. That shows how much Ubi loves Nintendo. Dumping old games on Switch hoping some will bite, they troll better than me. This is great news. Two good additions to an wvwr growing library. I already have them but only through PS Plus which I’m going to let lapse soon so I’ll make a permanent purchase on Switch. Awesome! Child of Light on the Nintendo Switch? Yes please! Child of Light is an amazing game and one of my all time greats, please let these be a physical release. Touch controls offering a level of interactivity like never before on Valiant Hearts? Or simply exactly like the touch controls on the mobile release? VH is a good game, but the concept and art style are more memorable than the gameplay. Worth playing, but I wouldn't double dip. Child of Light looks cool - is it a big jump up in quality? Child of light is a good game. Wouldn’t double dip though. Child of Light is an amazing game. So beautiful too. Can't wait to have it on my switch. I have it on my Vita, but would definitely buy again. @roboshort I thought the hard mode difficulty was just about right for people familiar with JRPGs. The difficulty on normal was good for introducing people to JRPG mechanics. Valiant Hearts is great, even if it only just scratches the surface of WWI. It also gets a bit uncharacteristically silly in places. 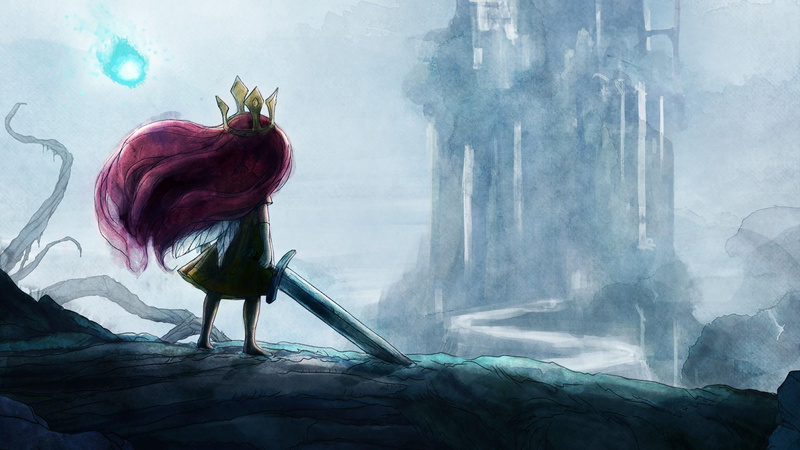 Child of Light's definitely one of the best RPG's I've ever played. Highly recommended to everyone. Not sure if I'll pick it up a second time but I'm hoping that Child of Light II document is a tease rather than a troll. I appreciate the 10 and under games for the kids, Ubisoft, but where are the games for the adults? A lesson worth remembering is when the next Nintendo console is released, if its not backwards compatible with Switch games, keep you Switch and games. Otherwise you will be buying them again on the Switch 2. Months of holding off on Vita were justified - Child of Light on Switch is happening after all! Great to see Valiant Hearts announced, too. The rest of the year is teeming with awesome games, but we all know that Switch will have no games to offer besides Smash come holidays. Fan wisdom and fan logic are impenetrable. What's in the ultimate edition? Was there DLC for the original? @Wraggadam1 Maybe I played the game on normal then.. It's been several years so I don't really recall. Got this on the Wii U and and PS4. I love this game! Guess I’ll have to get it on the Switch, too! I absolutely adore Child of Light! I've been waiting & hoping for it to come to Switch. Now, if only Guacamelee & The Swapper would make their way over. I absolutely loved Child of Light. I'll gladly double dip, but only if this is a physical release. NO WAY! Child of Light is so freaking good. Probably gonna double dip. I swear, the Switch has freaking everything. Finished Child of Light a few weeks ago. Great game! Valiant Hearts I might nab, though. @Nincompoop Everyone trolls better than you. I loved Child of Light and it's my sister's favorite game, may double dip on it again. Now a sequel is an insta-buy for sure! Child of Light 2 would be most welcome. Loved the first one on Vita! Ooh Valiant Hearts, this is bigger news that I expected. Was gutted when this didn't come to wiiu, this pleases me a lot. Yay another four year old game. Switch is killing it! Valiant Hearts is amazing, not sure if I would enjoy it now on Switch. I played it on Nexus Player (Android TV) and was great. Excellent narrative. Curious about Child of Light! @roboshort I'm sure they patched and changed the description of the diffculties, so hard mode was aimed at rpg veterans, likely due to feedback it was too easy. Made it a much better game. @Magician Me too. I loved it on Wii U and now have it on my Vita. I will have to get it on Switch too!! Um, "Child of Light" IS a full RPG, a rare Japanese-style RPG made by a Western developer. The only unusual thing about it is that the world (with seamless "dungeon" transitions) is traversed like a side-scroller, and even that becomes more like a traditional JRPG once you learn how to fly and hover very early in the game. So it's really a turn-based RPG with side-scrolling elements, not the other way around. Anyway, it's a brilliant game, so I'd love to see a sequel. And they said Valiant hearts wasn't suitable for Wii u owners. Sooo the Switch owners are more mature?! Either way: Great news that its coming to a Nintendo device. Better late then never.